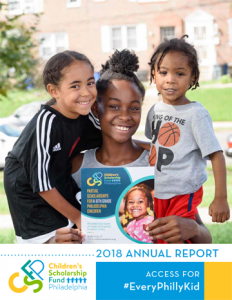 With over 17 years of experience and 24,500 scholarships awarded, CSFP provides Philadelphia children with four-year, need-based scholarships to attend safe, quality, K-8th grade schools. We are a stand-alone organization: our unique program is proven, consistent, and serves children most in need of scholarship support. Up to 3 children in a family may receive a scholarship. CSFP assists families in finding schools that provide a good fit for their children. Families can transfer their scholarship to another private school at any time. CSFP has no religious or political affiliation, a factor that sets us apart from other scholarship organizations. Our 170 diverse educational partners include independent, special needs, and faith-based schools. Students are selected from a random, needs-based lottery, and come from low-income households in all corners of the city. Not only have we received a perfect score of 100 from Charity Navigator in 2018, which places us in the top 1% of nonprofits rated by the independent charity evaluator, but CSFP has received a top rating of 4 stars from Charity Navigator for the past 7 years! 96% of CSFP alumni graduate high school prepared and on time, compared to 69% of Philadelphia public school students. "Without CSFP, I honestly don't know where I'd be right now." CSFP alumnus and Drexel University junior, Raushaun Williams.